We seek out the genuine taste than big brand names. 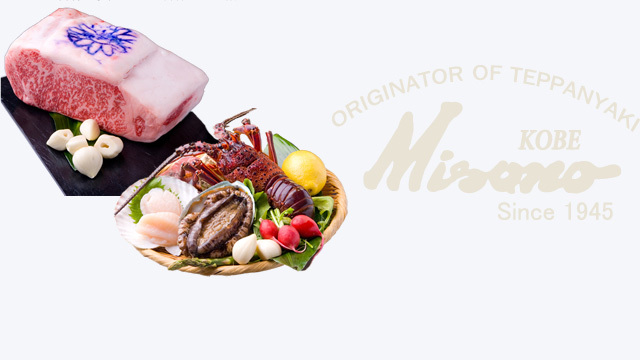 Misono carefully select all the ingredients from beef to vegetables, rice, and seasoning. We simply select only delicious ingredients with a professional's eye regardless of the place of production, brand, or price. This indicates that Misono proudly has a strong belief in the great taste of its Teppanyaki steak. Please enjoy the taste of each season. Seasons play a key role in the selection of ingredients. Generally speaking, meat changes only slightly through different seasons. On the other hand, vegetables and seafood have seasonality. Misono never misses the ingredients in season. You can also enjoy a slightly different selection of vegetables and seafood at each store. The attitude of persistently pursuing the great taste. Misono's biggest priority is that our chef perfectly cooks high quality ingredients and let the customers enjoy the freshly prepared food. We give close attention to the timing of grilling food and customers' preference sometimes with fun conversations to let the customers enjoy the taste of freshness as soon as possible. We respond to customers' requests as much as we can.